We in Sparkle Land are deeply moved by the original Easter story, and wanted to find a way to share it without overwhelming children with intense imagery. And so last year we crafted this story. It is called “Elija’s New Home”, and it comes out of our “by Thistle by Thimble” Series. “Elija’s New Home” tells the story of Peter and his beloved dog, Elijah, and offers a way into the original Easter story by telling a tale of the love and loss (and enduring life) of one devoted dog. It’s a touching and very inspiring tale — and perfect for this time of year, whether you want see the bible story with fresh eyes, or you’d love a reminder of the awesome processes of life, love and mother nature. Important Note: It is a “secular” tale, and appropriate for all backgrounds and religious affiliations! Sparkle Stories are also offering a little discount on their inspirational ‘By thistle by thimble’ series!! DISCOUNT: the NEW “by Thistle by Thimble” Sample Pack! The “by Thistle by Thimble” Subscription Series is one of the least known of our Series, but it offers the richest content of all! So we want to inspire you to try it! This Series grew out of the many emails we received asking for ideas and support. Parents asked us about how to address loss, how to talk to their children about challenging times, how to inspire courage, or wonder, or confidence. And so the “by Thistle by Thimble” Series was born! The stories in this Series are all “pedagogical” and “therapeutic” in their intention. 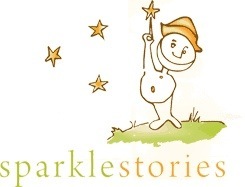 But they are still “Sparkle Stories” so they are delightful, entertaining, thought-provoking and deeply calming! We just created a “by Thistle by Thimble” Sample Pack, so it’s easier to give the Series a try! This Pack includes three of our favorite stories pulled from the Subscription Series (and for all you Thistle Thimble subscribers, you will soon find three new stories in your boxes!). For this week, we’ve created a discount of 1/2 off the normal Sample Pack price of $6. It’s an hour of rich, thought-provoking stories. Click HERE to add the Sample Pack to your Shopping Bag for $3! Click HERE to read more about the stories in this new Sample Pack!